By now, you probably know that this is the year of the bird. 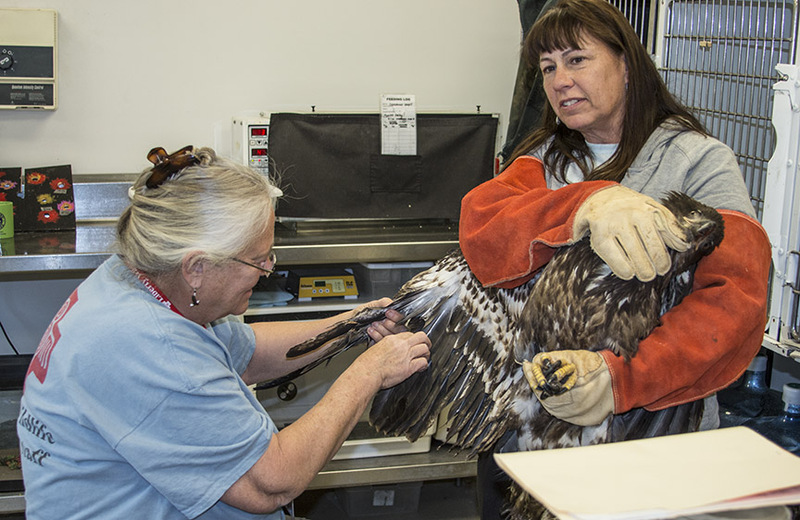 At Liberty Wildlife, we are known for our work with birds, even though we care for most native species. 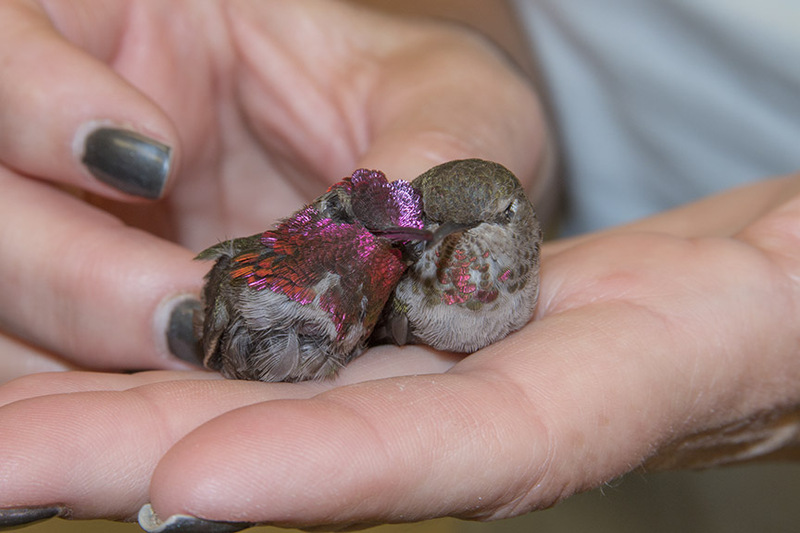 However, birds make up the greatest number of patients and the educational ambassadors found at Liberty. Since this Year of the Bird designation is being celebrated, we feel it is a great opportunity to showcase our avian neighbors. If you have read the National Geographic feature on why birds matter you no doubt saw the quote by Jonathan Franzen. 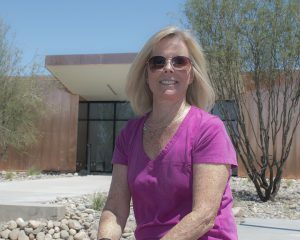 “It’s not just what they do for the environment—it’s what they do for our souls.”….Amen to that! A case in point that is near to me came from a conversation I had with my brother, Bill who with his wife Zonna, live in Rockport, Texas…dead center for Hurricane Harvey. The decimation of the area was jaw dropping. The toll on human life, the economy, the environment will take a very long time to erase. However, the paucity of wildlife, particularly bird life is so “in their faces” that it seems hard to ignore. In fact it is staggering. On daily walks, the absence of wildlife, particularly birds is palpable and depressing. Who would have thought that the sighting of one bird on a daily walk in an otherwise verdant sky of winged presences would penetrate their awareness so greatly? Maybe we have just taken their presence for granted for so long that the absence is totally soul wrenching. With all of this in mind, at Liberty Wildlife we plan to celebrate the power of birds to enrich our souls…as well as heal our environment. 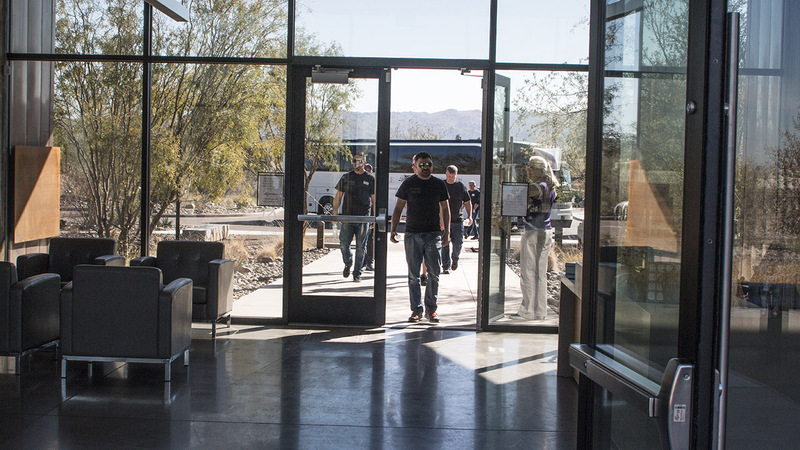 Look for articles in our electronic newsletter, Nature News, in our blog entries, on-site programming, our speaker series, and the announcement of other valley and statewide celebrations. Take this opportunity if you don’t already, to start to notice the birds in your surroundings. Look for their interactions within your realm. Listen for their songs. Watch them fledge babies, pollinate plants, rid you of bugs and rodents. Appreciate their migrations and pay attention to the ways they are so like humans. In a year from now, let’s gather, spiritually, virtually, or actually to celebrate what we have gotten out of the exploration and celebration of the Year of the Bird. The intake total for this year is now up to 250. We actually did have a winter this year (it happened on a Tuesday I think, around 5am…) and except for a couple more coolish days, the temps can go no place but up. It’s been a busy, eventful two weeks. 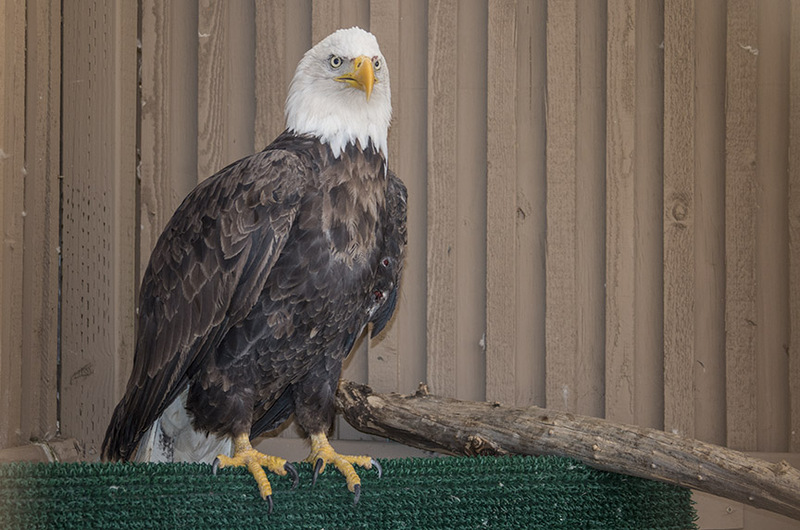 Another bald eagle came in, we had a huge work-day event with over 300 volunteers, and we got a new mammal for the educational team, among the usual intakes and educational programs. In the middle of the normal activity, we’re gearing up for our annual Baby Bird Shower and making plans for the Sippin’ the Spirit of the Southwest fundraiser that is slated for later on this spring. 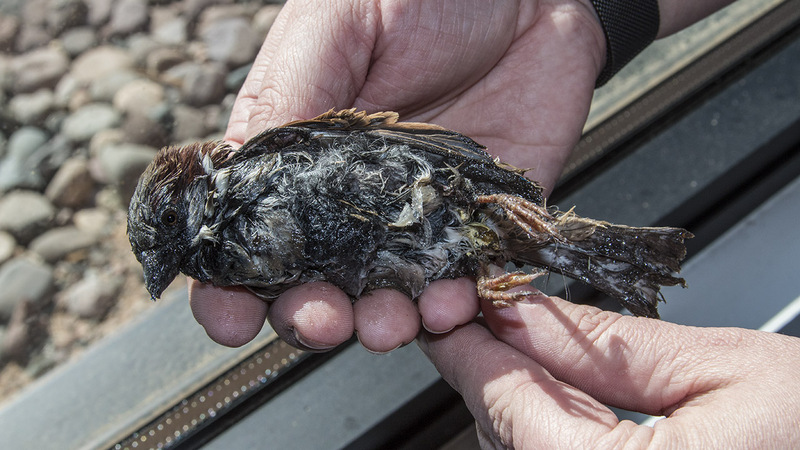 Sigh… More totally preventable injuries came in recently, among them the little sparrow that was covered in a glue-like substance used to dissuade birds from alighting in selected areas. 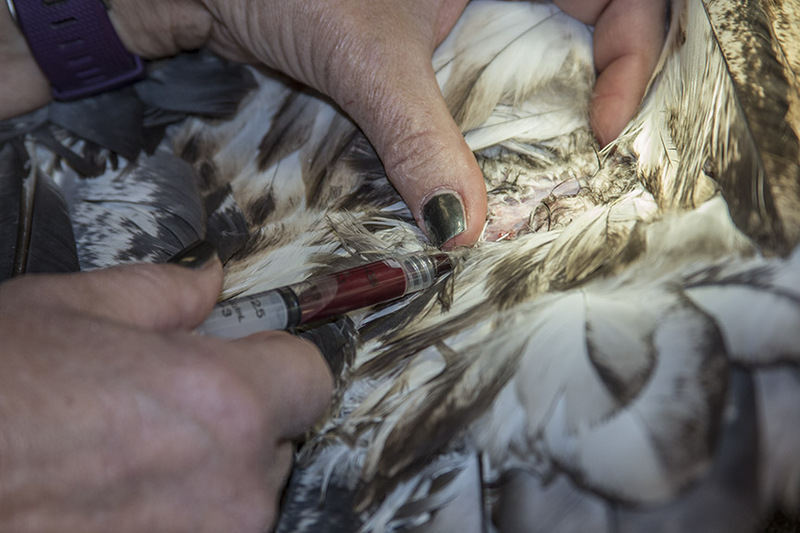 Unlike glue traps which are designed to catch and hold wildlife, this stuff is applied like paint and is meant to cause maximum discomfort to birds who are unlucky enough to land on it. 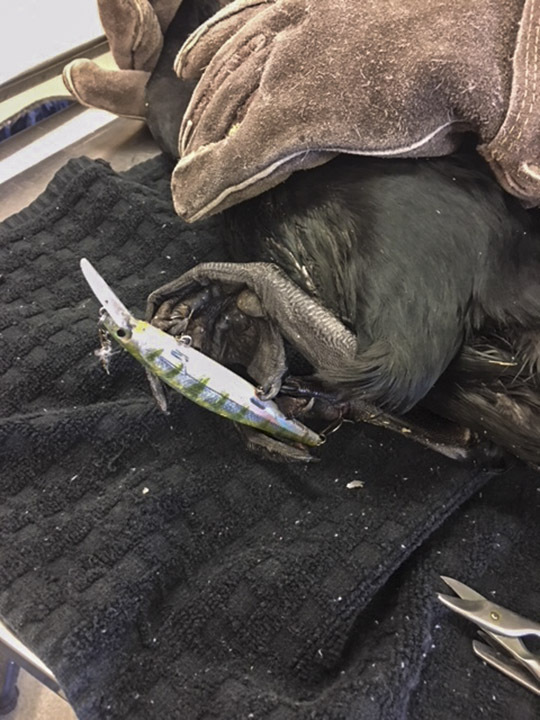 The second picture shows a cormorant who became involved with a multi-hook fishing lure. I guess I’ll just keep bringing this up as long as people keep thoughtlessly discarding dangerous fishing gear. Whether its plugs like this or just the monofilament line, this type of trash is deadly to wildlife. 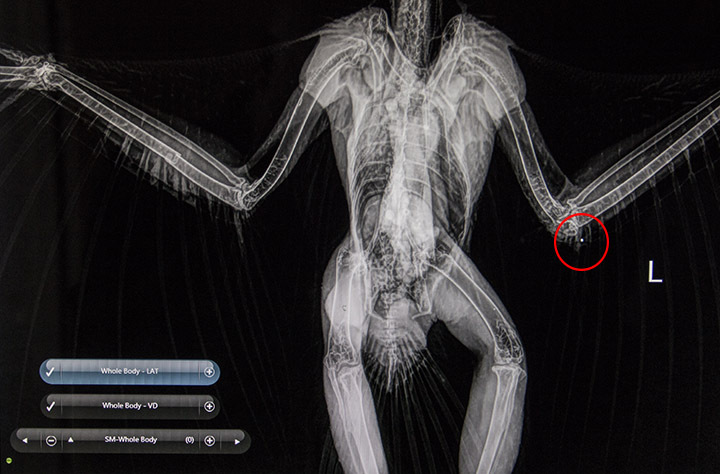 The x-ray is a Harris’ hawk that was shot, sadly within walking distance from the Scottsdale Hyatt where Liberty holds weekly educational flight displays, reiterating the illegality of shooting native species such as hawks and other raptors. 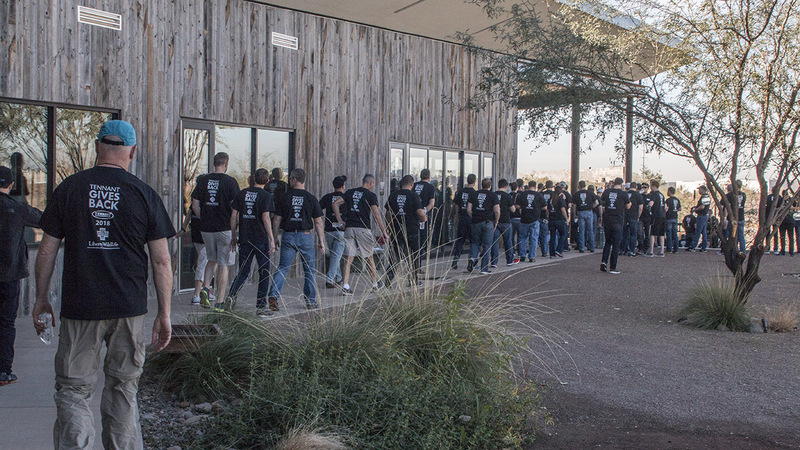 Only two hours, but 340 volunteers! 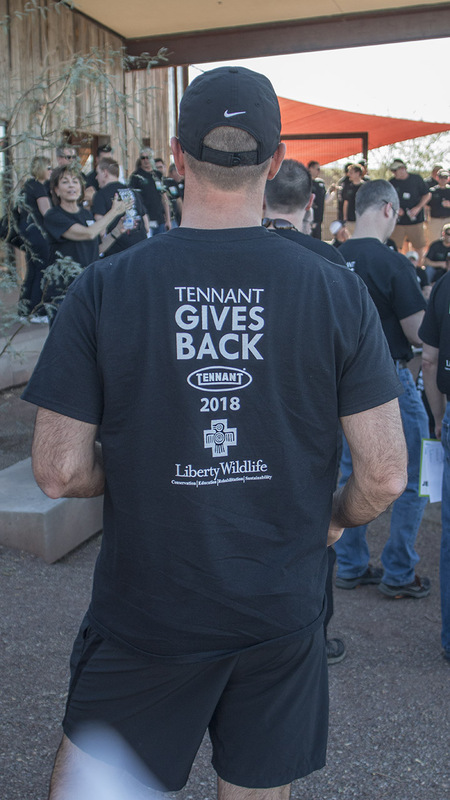 As mentioned in the last TW@L, the Tennant Company, a leader in the cleaning industry, chooses one charity each year to support with a generous donation AND a large contingent of volunteers who work for two hours doing whatever the organization needs them to do. 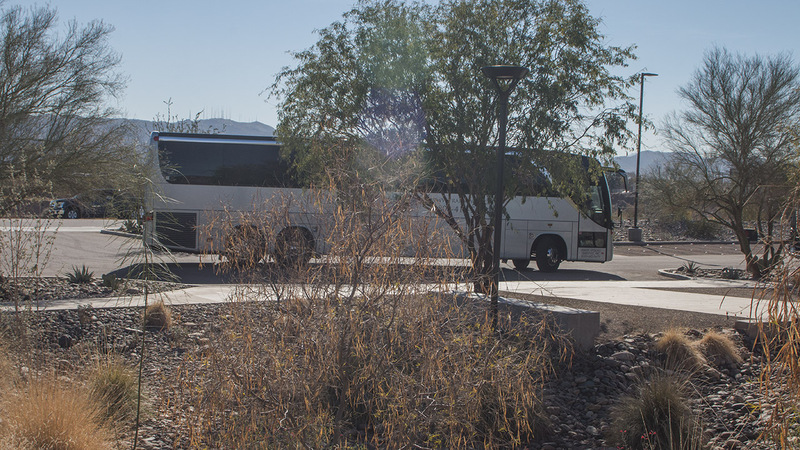 Liberty was their chosen charity this year and after weeks of planning and coordination, the big day arrived on Wednesday, January 31st. 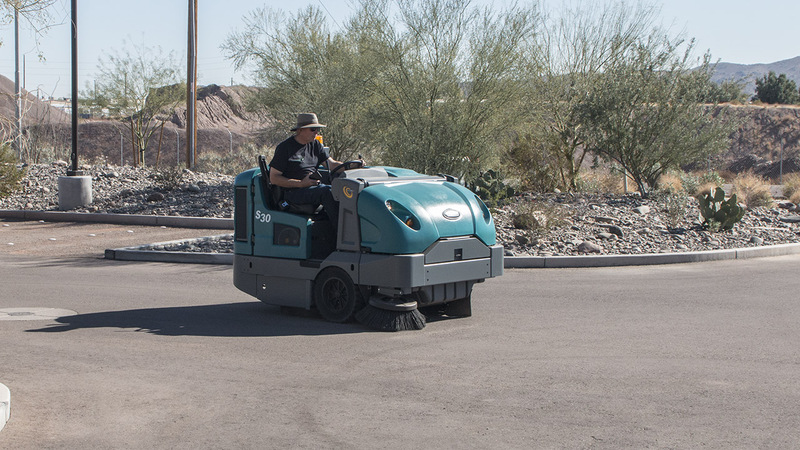 Beginning with one of their Zambonie-like machines sweeping our parking lot, six buses brought almost 340 volunteers ready to work. After presenting Liberty with a big check (literally! 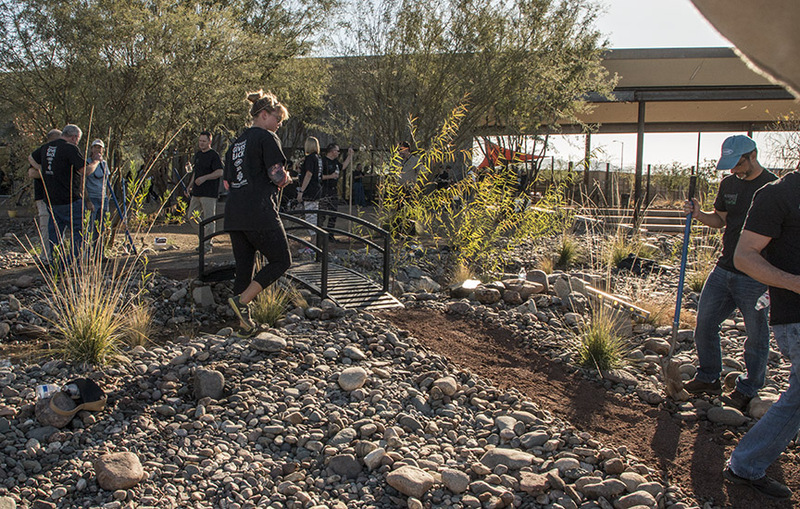 ), the group divided into teams and began two full hours of cleaning floors and windows, spreading almost 70 tons of gravel and granite, painting enclosures (including the reptile habitat), moving piles of scraps, and completing various construction projects. 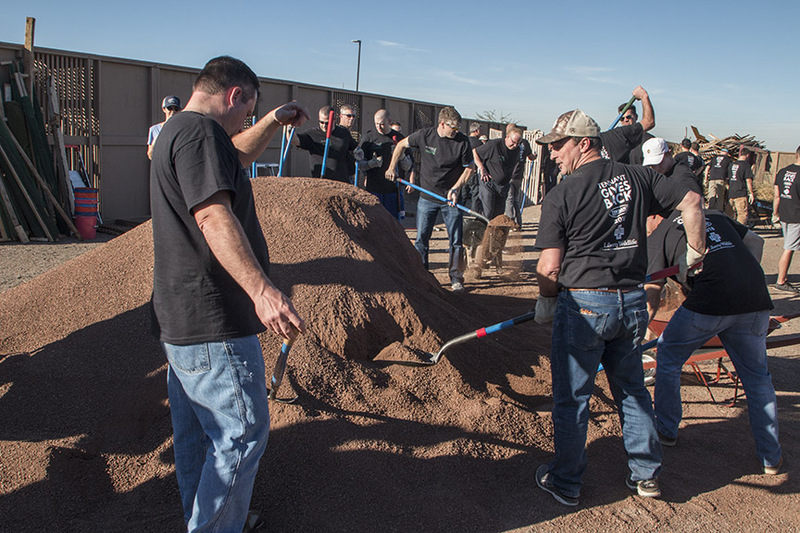 We had gone to the Phoenix Community Tool Bank to obtain 90 shovels and rakes, 40 wheelbarrows, 340 pairs of work gloves, and various other smaller tools for the volunteers to use (thanks to Barry Ziegler for the use of his truck and trailer!) 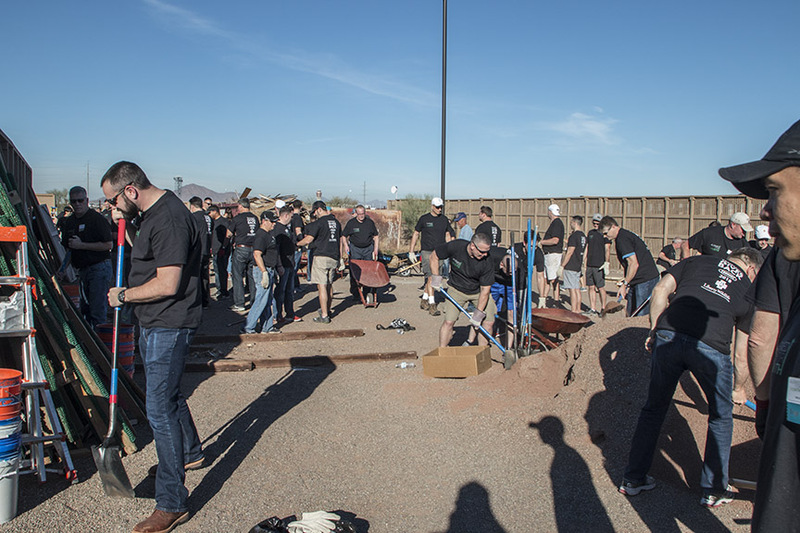 It was amazing to see how much could be accomplished in a short period of time when you have so many willing hands at work! Thank you Tennant! He really likes to climb! 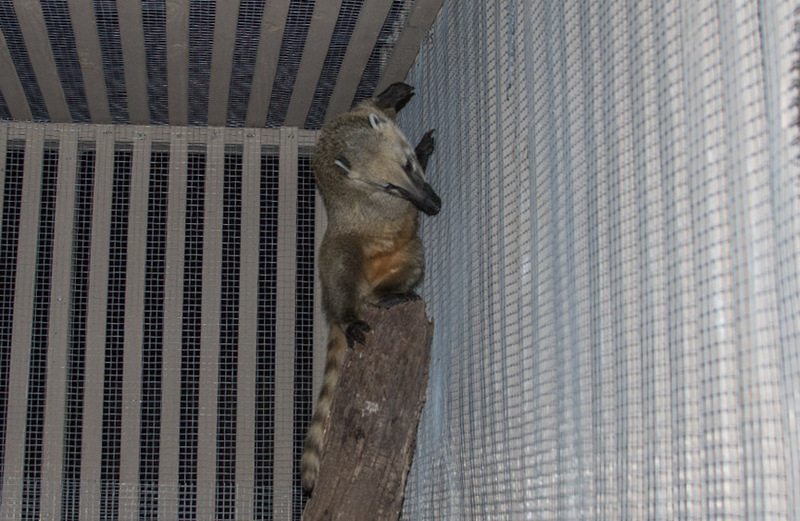 Liberty acquired a new education mammal last week, with the arrival of Cody, a captive-raised coatimundi. 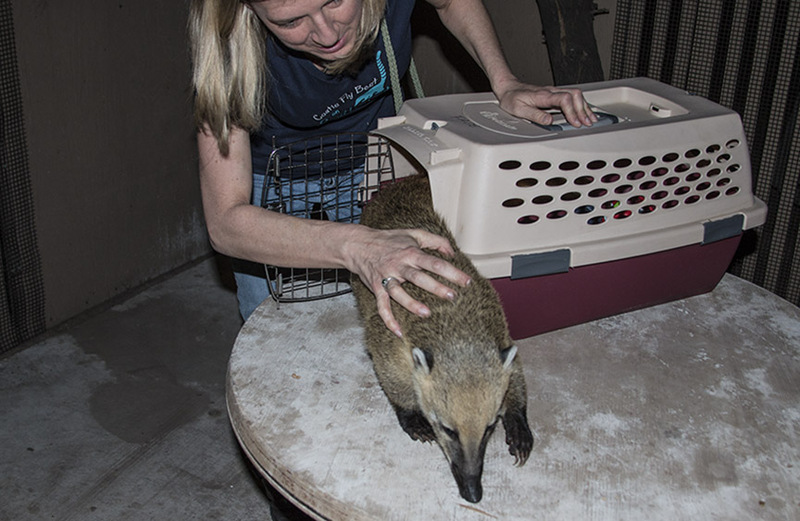 A former resident of Indianapolis, he was flown in by two of his handlers and was placed in a new habitat/enclosure on the east side that had been specially modified for his safe use. A native of the Southwest, he will join our slowly growing mammal display team as he acclimates to his new home at Liberty. 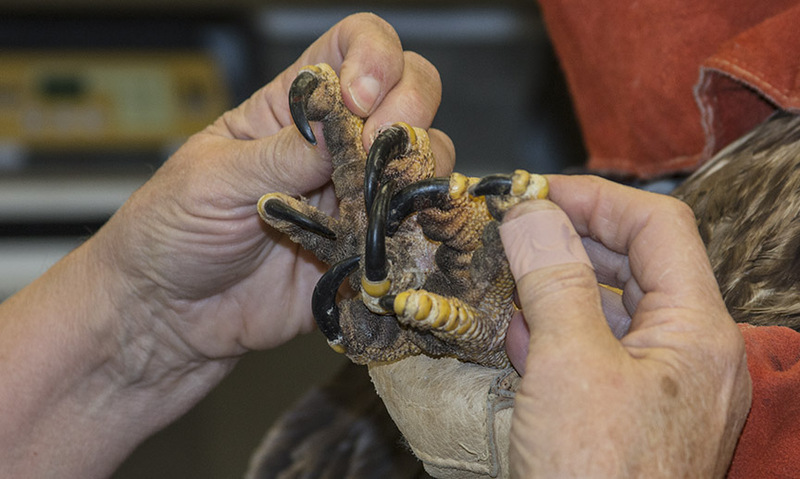 He’s missing many feathers – and a talon! 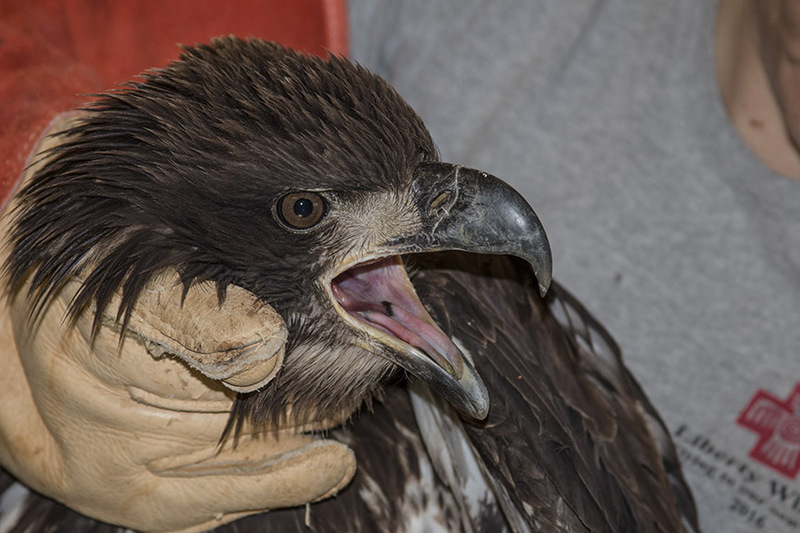 Another young bald eagle was brought in from the Flagstaff area on the afternoon of the Tennant event (thanks to Tim!) The bird presented no fractures and his lead levels, though elevated, are not egregiously high. 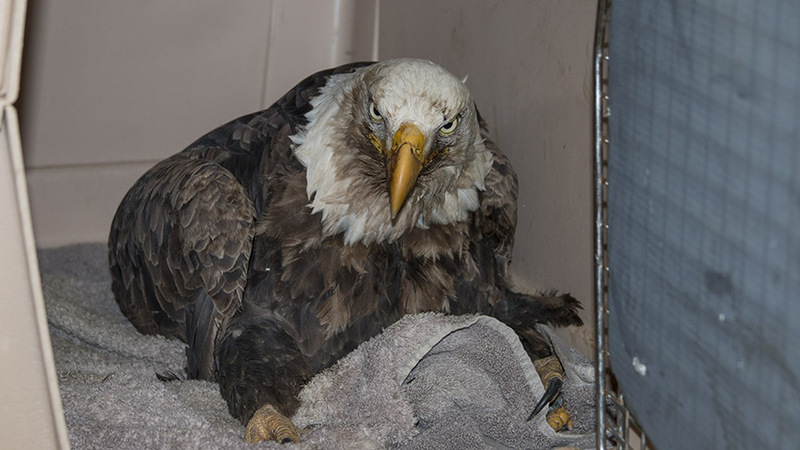 He did however test positive for aspergillosis and he is missing numerous primary and tail feathers indicating he might have been trapped in some man-made structure or apparatus. 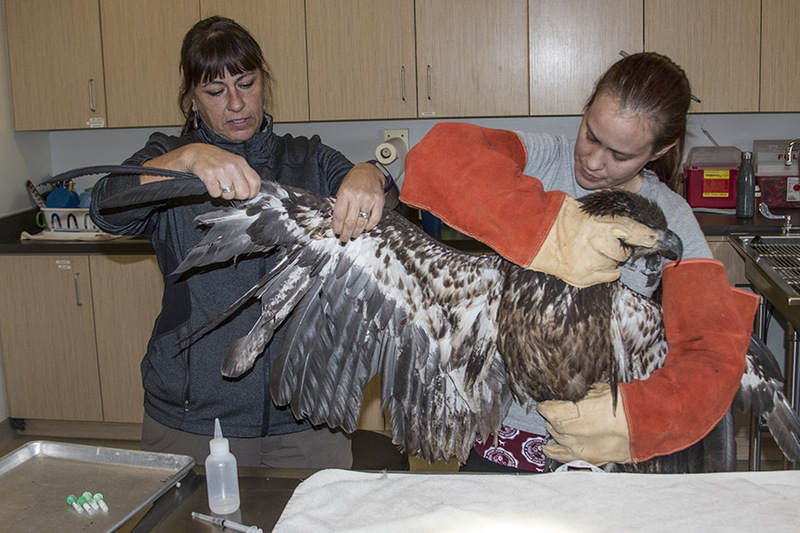 In addition, the remaining feather shafts were damaged, precluding the imping process we would normally consider to speed his release. Otherwise he’s reasonably healthy and has been moved to an outside enclosure with another juvenile bald where he’ll remain until he can molt and regrow some new primaries and retrices. Remember this young bird from the last TW@L? 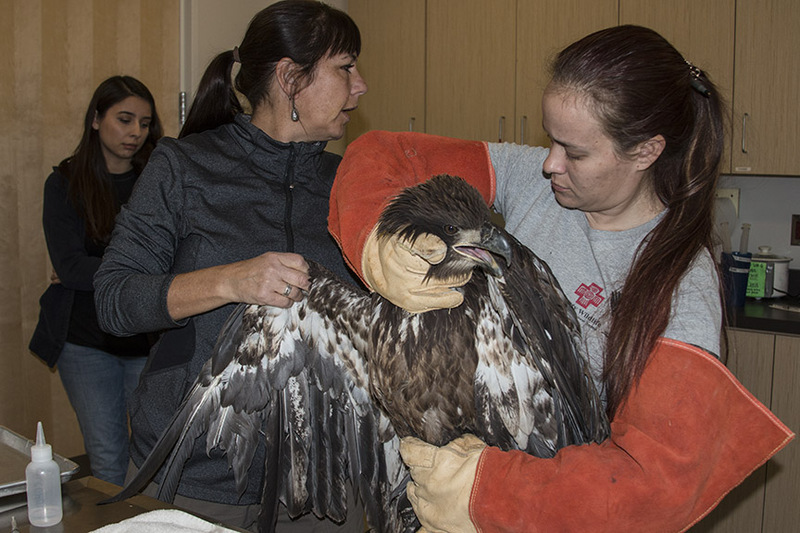 Remember the young bald eagle that came in a few weeks ago from the Williams area? His lead level was dangerously high and the chelation treatment began immediately. Fortunately, he responded well and the level of the toxin in his blood dropped and seems to be remaining lower, although further measurement and observation is required. 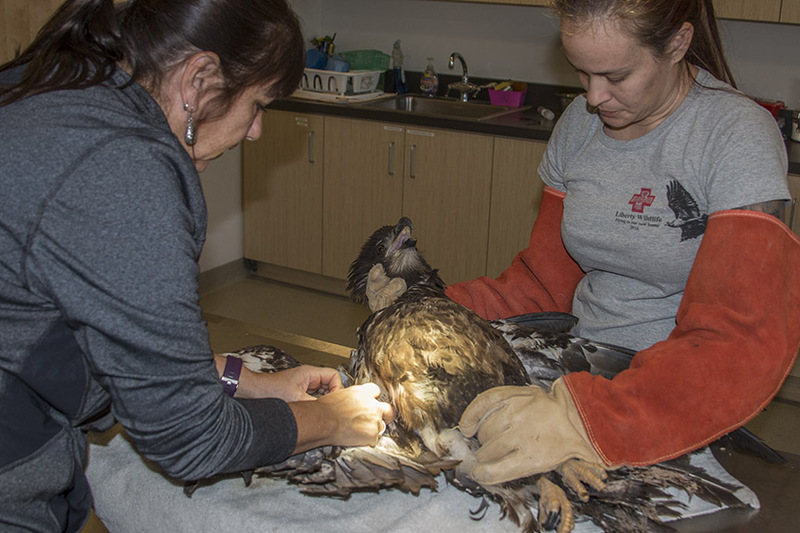 The situation will continue to be monitored as he remains with us and regrows his damaged tail feathers. 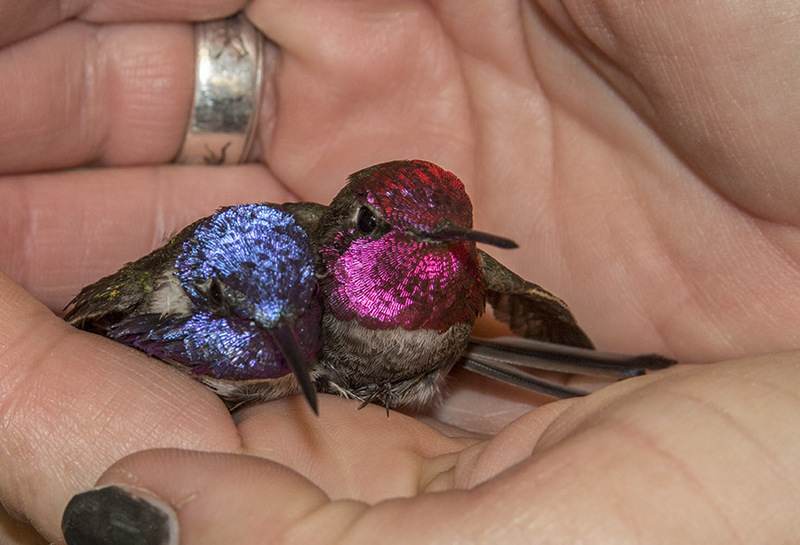 There are 338 known species of hummingbirds in the world, the most common in Arizona are Costa’s and Anna’s. 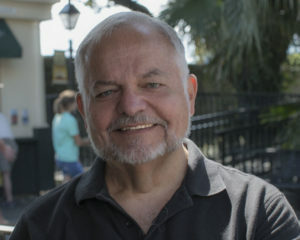 It is sometimes difficult to differentiate between species, and further between sexes within a given species. Recently I had a chance to get a couple of photos that might help identify Anna’s from Costa’s and between male and female Anna’s. Now you can amaze your friends with your hummingbird knowledge!